Question: How fast are Scows? Answer: These are pretty fast boats. I have seen 15 knots on the GPS speedometer on the I-20.. The 38-foot A Scow is the fastest one design scow class. 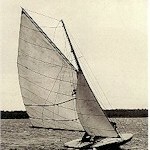 An A Scow held the monohull speed record for decades: 33 knots (38 mph). The Portsmouth Yardstick rates the A scow as the fastest centerboard boat. Question: Am I going to get wet sailing a scow? Answer: Yup. These boats sail close to the water and the forward crew provide a wind and water screen for everyone behind. Self-bailers at the floor of the boat will empty the water the spills into the cockpit. Occasionally, these boats dump. Question: If the boat goes over, can it be righted? Answer: When that happens, the flotation at the head of the main will keep the boat from turtling. With the sail on top of the water, the hull will float perpendicular in the water. The boat is righted by standing on the lower bilgeboard until the sail and mast swing upright. Be sure to uncleat the main sheet before righting the boat or it may sail away from you. Question: When was the Racing Scow invented? Answer: One of my favorite questions, so you can imagine my surprise when it appeared right here on scowsailing.com! The class was developed in the 1890s in the midwest and became an official one design class just after the turn of the century. This is a very old and prestigious sailing class. This picture is from a book on the centennial of the Inland Lake Yachting Club. Question: Where does the word Scow come from? Answer: A Dutch woman told me it derives from the old Dutch word: Schauw (pronounced: how). This is a large flat-bottomed boat built for the transport of heavy cargo, usually on inland waterways.